Hey Guys! Bobcoffee7 here! There is a new reviewed by you but first lets take look last week’s! The question was: What is you favorite igloo to decorate? Amazing answer Bluetrue2006!! Now for this week’s question: This week – big or small – we’d like to know what you’ve done to make a difference in your community. Here are the rules: Put your penguin name in the comment. 50-75 words. If you win like Chilli 2 did on the ultimate field op idea you get 10,000 coins and get your answer posted on the next reviewed by you like Bluetrue2006 did here! Lol, I am trying to think of a catch phrase. Any ideas? It’s ok you can post all you want. I need you to cover the blog from Aug 21-28. Going on Vacation. New Club Penguin Reviewed By You! Make A Difference Stamp! Hello Penguins! There is a new Reviewed by You! 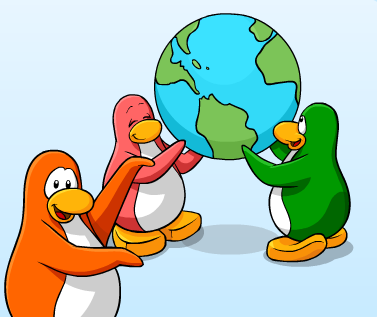 The Mountain Expedition starts August 13, and Club Penguin sees lots of you are getting ready for the climb! This week, Club Penguin would like to know: What challenges you think you’ll face on your way to the top? I think that this will have something to do with my Ultimate Field Op Idea! Get commenting on the Club Penguin blog! Remember if I can win like I did here, you can too! The winner gets 10,000 coins! LOL he wants us to go on some weird site. OMG! People Guess What!?! I got on the Reviewed By You! Oh my goodness! Is this real or what? Did you guys check out the new Reviewed by You? LOL! I screamed when I saw it! So I got the winning prize. I won 10,000 coins! Let’s see! Club Penguin liked my idea for the new Field-Op! I am shocked! It’s a situation where Klutzy figured out a way to change all the blue signs with white arrows throughout the paths of Club Penguin. The arrows would be pointing to different directions, and many penguins would be lost in the wilderness. It would be an EPF Agent’s job to rescue the penguins, fix all the signs back to normal, and importantly save Rookie, who gets lost in a place full of marshmallows! Thursday sees the launch of a new Penguin Style featuring some musical items. Do you have a favorite musical instrument to play? Tell us about it! Do you know how cool this is? A Club Penguin Blogger getting picked! Club Penguin making a picture about your idea and other bloggers noticing you? LOL This is awesome! Since I got picked, I am planning to talk about this field-op more with Club Penguin. Perhaps they will give me some sneak peeks or exclusive information? Who knows if they will use my idea or not! Hey wanna meet up on cp sometime. I have not seen you in while. Woah! I always wanted My name on the whats new blog! your lucky chilli lol. Your really really lucky! Well don!!!!!!!!!!!!! Club Penguin's 203 Issue Newspaper! Fall Fair Exclusive! And Member's and Non-Member's Free Item Given Away? Hello Penguins! Today is the 203rd Issue of the Club Penguin Times! Are you going to read today’s main article? After that, here is some classified news! The Fall Fair is coming tomorrow! So that means Rockhoper is coming tomorrow! Here is everything you need to know! 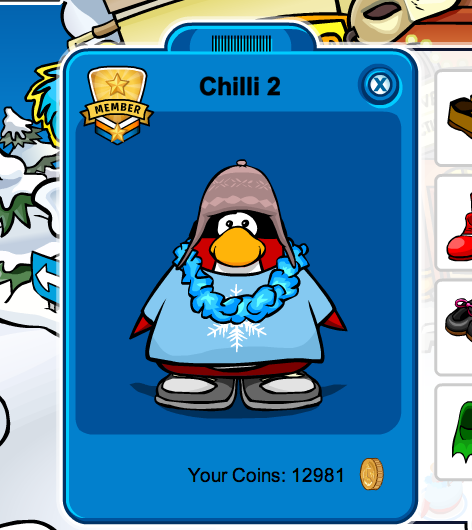 Did Club Penguin giveaway what the free clothes for non-members will be and what outfits members will be able to buy? Check out this photo. It appears non-members will get a free magic hat, and members will be able to purchase that cool red outfit you see below. Last. here are the upcoming events! Club Penguin’s 203 Issue Newspaper! Fall Fair Exclusive! And Member’s and Non-Member’s Free Item Given Away? Aug-Nov Snow and Sports Catalog Hidden Items 2009! And a New Pin! Hey Penguins! Sorry this wasn’t posted sooner! I was on vacation! Me: Yes I did post those things while I was on vacation, but did you notice something? All the screen shots are either from Club Penguin or from old photos of mine. During vacation, I had no access to taking new photos off Club Penguin. That’s why this update is late and the 202 Newspaper news has old photos. Here’s a photo of me and my friends. We had an awesome time! Bummer! No hidden items! Check it out though! And there is a new pin! It is a Koi Fish! REMEMBER: My 1 Year Serving You Party is tomorrow! I hope I see you there! You may have a chance to win a Series 3 coin code! Click here for info! I hope the next sports catalog has some hidden items.